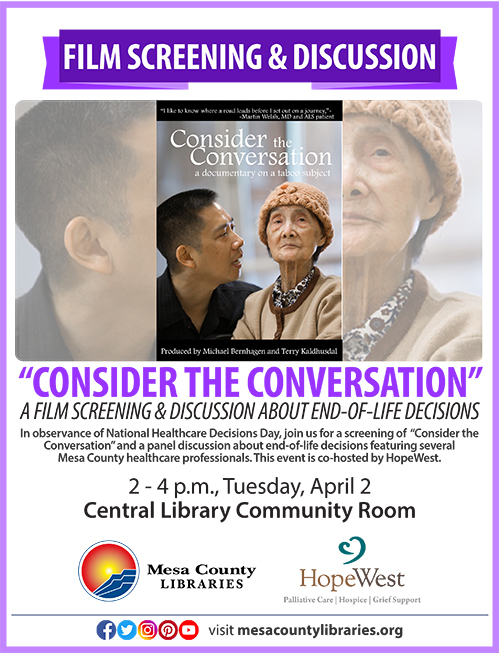 In observance of National Health Care Decisions Day, join us for a screening of “Consider the Conversation,” an acclaimed film about end-of-life decisions, and a discussion on this important topic. The film and discussion happen at 2 p.m. Tuesday, April 2, 2019, at the Mesa County Libraries Central Library, 443 N. 6th St., Grand Junction. The film and discussion are open to the public at no charge. The open discussion will be moderated by Brian Whitmore, community relations director for HopeWest and a longtime provider of end-of-life information to health-care providers and patients. Also present for the discussion will be Dyann Walt, adult services supervisor for the Mesa County Department of Human Services who works to educate the public about advance-care planning. This event is co-hosted by Mesa County Libraries and the Mesa County Advance Care Planning Task Force (St. Mary’s Hospital and Regional Medical Center, Community Hospital, Mesa County Department of Human Services, HopeWest, and Rocky Mountain Health Plans).